so here we go with the last Friday Facts before the big day next Thursday. The 0.12.23 is getting latest tweaks regarding the integration of Steam functionality for sharing saves for one account across different locations (different computers). In the meantime the majority of the dev team has been playtesting the game for past couple of days (and doing the usual "factory building shouting" across the office). Hopefully it will be out in the beginning of the next week. Updated existing trailer. The new gameplay trailer is hidden and will appear together with the game release (just to keep the expectations=)). New Factorio cover image (Albert is really proud of this one=)). A bunch of selected screenshots. As usual, we are open to ideas and recommendations in the comments on the forum=). There is now a Steam FAQ page on the Factorio subreddit which contains a lot of useful information regarding the Steam release. We have had a betting round in the office what will the Factorio review percentage be in 1 week and 1 month after the EA release (so 2 numbers, i.e. [90, 86]). You are welcome to give your bets in the comments. We took down the Furnace Attendant tier from our webpage. The Mining Drill Operator is still available, because it adds stuff (name in the game, gfx wiki access) which will not be available after Steam release. There has been some discomfort on the forums about people overpaying on the Furnace Attendant tier (because Scenario Pack will be given for free alongside the basic game). We don't percieve this as an unfair treatment on our side. Still, we are thinking about ways how to provide some additional value / recognition to people who supported us by buying the higher tiers. There is still a possibility of Factorio release day coinciding with Kovarex's baby being born. 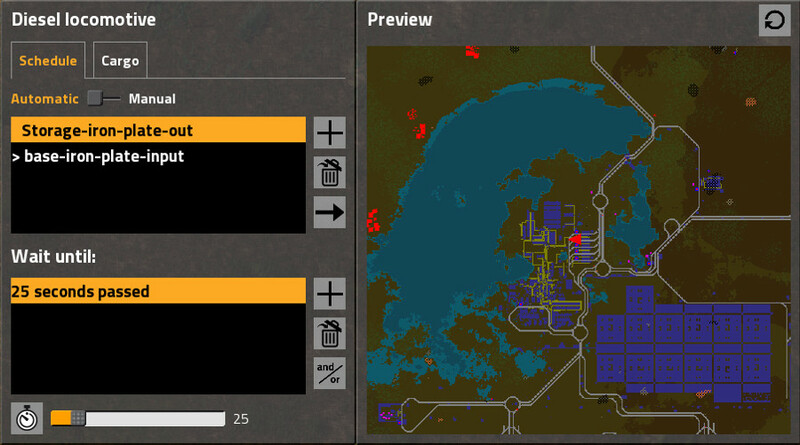 One of the new features in the 0.13 will be a new screen for viewing all the trains in the game. This one is invoked from the mini side menu mentioned in one of previous FFF. The screen basically shows every train depicted as a minimap and a train schedule below it. Trains will be ordered lexicographically based on the first station (also lexicographically) in their schedules (this should be the "expected" ordering - see trains sharing the stations close to each other). Schedules give hint about current station and whether the train is on the way / waiting in the station / in manual mode or without path. Also there is a search field which narrows the listing based on the stations in the schedule. Below is an example of the trains overview. 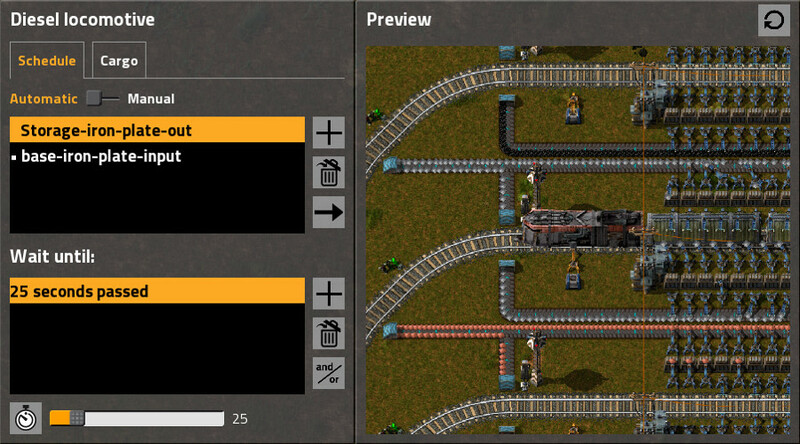 We made some more updates to the existing single train screen. Namely adding the "open ttd" inspired preview of the train. There is a switchable "camera view" and "map view". Both are zoomable by scrolling the preview. Check out below how it looks in the game. We are also thinking about using this embedded minimap / camera views in other parts of the game. One straightforward example would be to have a camera entity (it could also be just existing radar entity). Then there would be a screen pretty much like the trains overview screen showing all the cameras and you could quickly check what is happening in different parts of the factory without physically going there. Or maybe another approach would be to allow player (with a special object in his armor?) view real-time any part of the map covered by radars. The non-surprising comments thread at our forums is waiting for your feedback.